NCHM JEE 2014 Exam Day Guidelines - National Council of Hotel Management Joint Entrance Examination, a national level hotel management entrance exam is scheduled to be held tomorrow, i.e. April 26, 2014 at several test centers located in 33 Indian cities. The entrance exam, which is also commonly called as NCHMJEE, will be conducted by National Council of Hotel Management and Catering Technology and Indira Gandhi National Open University to offer admissions to qualifying candidates for B.Sc in Hospitality and Hotel Administration course. This article brings to you basic NCHM JEE 2014 Exam Guidelines to be followed by candidates so as to avoid last minute examination rush. Some interesting facts of the exam, time management and exam tips from NCHM JEE last year toppers are also shared. Besides, information on paper pattern, what to carry to the exam hall, and dos and don’ts during the NCHM JEE 2014 exam is also there. Candidates will not be allowed to carry back the NCHM JEE 2014 question paper booklet. Candidates will not be given attached OMR sheet with question paper booklet. As OMR sheet are not provided, so candidates do not have the option to tally their answers. NCHM JEE 2014 Official Answer Keys are not released. Admissions to qualifying candidates for three year hotel management course are offered on the basis of marks obtained by candidates in the written examination. Group discussions and personal interviews are not part of admission/selection process. 1. Maahi Trivedi: The hotel management student at IHM, Mumbai as well as NCHM JEE 2013 9th rank holder shares that always skip a question you don’t know and come back to it when you have more time, towards the end. This way you won’t miss out on a question you knew the answer but didn’t have to attempt the question. 2. Vishnu Subbaram Ramamoorthy: The 10th All India Rank (AIR) in NCHMCT JEE 2013, shares that questions for which a candidate is sure should be attempted first. Since I was not sure about some GK questions, I managed to finish 194 in the given time. Wherein I solved the Logical Reasoning first, followed by English Aptitude, the Science section, after which I attempted the Social Awareness section and lastly the General Knowledge section. 3. Lisa Sunny: IHM Hyderabad student, who obtained 1013 rank in NCHM JEE 2013 shares that candidates must attempt all questions in aptitude for service sector as even the wrong answer will score you +0.25 marks. 4. Kodaganti Vamshi Naidu: IHM Hyderabad student, who secured 677th rank in NCHM JEE 2013 shares that candidate should first attempt the section which is his/her strong domain. The trick is not to waste time on any of the questions that you are not sure about. It is a sensible move to not to attempt a few confusing questions to shield our marks from negative marking. 5. Devashish Pathak: The hotel management student at IHM Hyderabad, who secured 821st rank in NCHM JEE 2013 shares that questions on which candidates are clueless should not be attempted. Candidates will get a single paper comprising questions from five different subjects/sections. The NCHM JEE 2014 question appear shall carry total marks of 200. Three hours will be given to the candidates to complete the paper. Each question carries one mark. For each incorrect answer 0.25 marks will be deducted. Negative marking is not applicable for “Aptitude for Service Sector Section”. The section awards graded marks- one mark followed by 0.75, 0.5, 0.25 mark (in preference order) for the most apt answer. Carry two copies of NCHM JEE admit card duly attested by gazzeted officer at your respective examination hall. Show both of the admit cards to invigilator for information verification. Both admit cards will be signed by the invigilator. One copy of the admit card will be submitted at the examination center while the other will be returned to candidates. If you have still not downloaded admit card, check here, to download the same. Reach the allotted NCHM JEE 2014 Test Center atleast an hour in advance. Exam timing is 10: oo am to 1:00 pm. The reporting time for the entrance exam in the information brochure is specified as an hour prior to the exam time i.e. 9:00 am. The NCHM JEE 2014 Pen and Paper Exam will start at 10:00 am. Candidates reaching late at test centers will not be allowed to take the exam. Revise important topics. Go through the notes prepared for General Knowledge & Current Affairs section or any other section of your choice. Eat healthy breakfast before leaving for the examination center. So, that you remain energetic and efficient to cope with three hours duration exam. Have 8-10 hours of sleep prior the exam day. This helps candidates to calm down exam anxiety and nervousness. 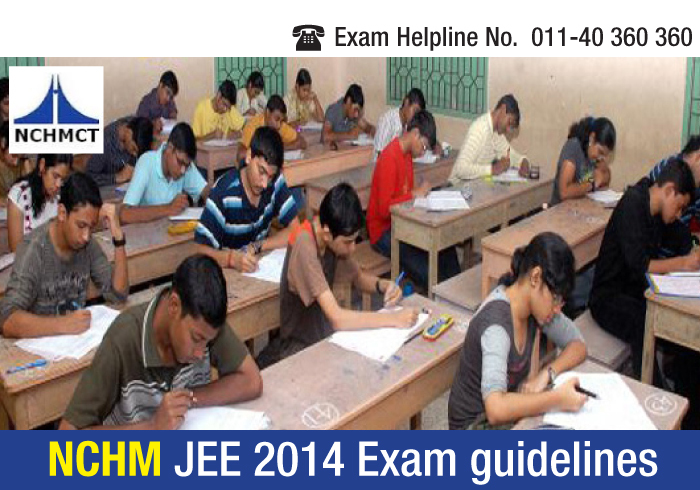 Listen clearly to the general announcements made prior to the NCHM JEE 2014 exam. If you need clarifications on any issue, approach the invigilator present. Get seated at your allotted place. Provide your signature on the Attendance Sheet of NCHM JEE 2014. Candidates must write the Question Booklet No at the specified box/column on the Attendance sheet. Fill-in correct details such as your name, roll number, and other particulars on the question booklet provided to them. NCHM JEE 2014 scores will be accepted by 21 Central Institutes of Hotel Management, 16 State Government Institutes and 15 private institutes of Hotel Management.